SAETA, group for experimental music, saw its beginning in 1977. The group asserted in years 1979 – 1981. 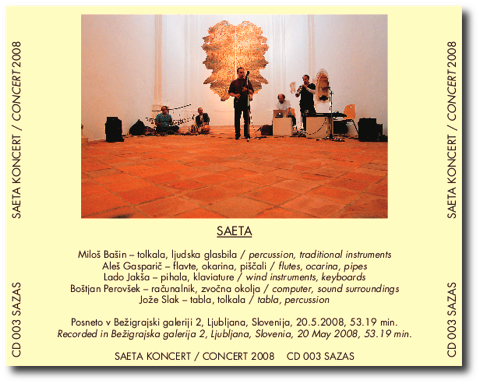 CD is bringing us a concert of the group, recorded in Bežigrajska Gallery 2, Ljubljana on May 20, 2008. About music – two visitors. Recorded in Bežigrajska gallery 2, Ljubljana, Slovenia, May 20, 2008, 53.19 min. 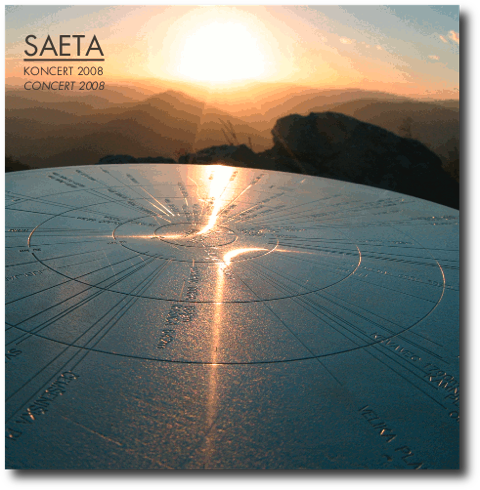 SAETA, group for experimental music saw its beginning in 1977 in Ljubljana, Slovenia. Thank you for inviting me to your concert yesterday, and congratulations. To be honest, I’d felt slightly apprehensive beforehand – I let myself be talked into attending experimental-impro-jazz-fusion-noise-eclectic-you-name-it events too often, and, seeing as you were to play live, I thought I was in for something of the sort rather than the kind of music I know from your recordings. As it turned out, I was thrilled. Great music and you were great to watch, too. I loved the way you guided us up and down, throughout the concert, so that I’d suddenly find myself in a completely different part of the music, with no idea how I’d got there, not having noticed the transition, just aware of the sound being totally different. I was really impressed by this feeling of being gently taken through transitions. How come you don’t perform more often? I’m joining the Saeta fan club and look forward to invitations to your future concerts..